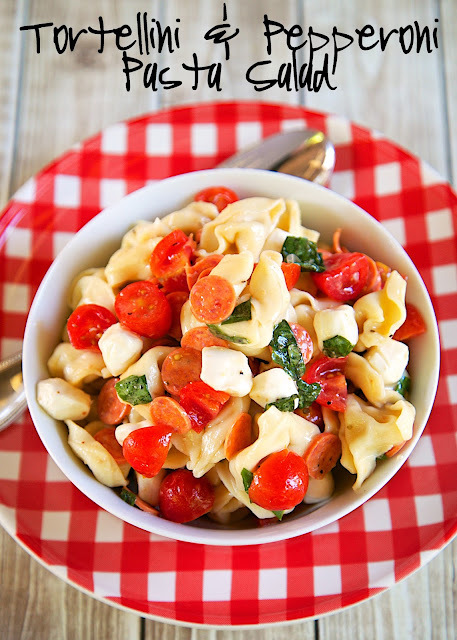 Tortellini and Pepperoni Pasta Salad Recipe - I am not a fan of mayonnaise, so I am always looking for non-mayonnaise pasta salad recipes. A friend sent me this recipe and it sounded right up my alley. It has cheese tortellini, pepperoni, basil, fresh mozzarella, tomatoes and caesar dressing. All of my favorites! Can make ahead of time and refrigerate. I had some leftover Caesar dressing from our Cajun Caesar Grilled Chicken and decided to make a quick and delicious pasta salad with it. I am not a fan of mayonnaise, so I am always looking for non-mayonnaise pasta salad recipes. A friend sent me this recipe and it sounded right up my alley. It has cheese tortellini, pepperoni, basil, fresh mozzarella, tomatoes and caesar dressing. All of my favorites! I used a bottle of Kraft Caesar Vinaigrette dressing for both recipes. I whipped this up the day before we ate it. I wanted to give it some time to soak up all the flavors. It tasted great! We ate this a couple of days with lunch and dinner. We both really enjoyed all the flavors. This makes a lot, so it would be great for a potluck. Cook tortellini according to package directions; drain. Rinse with cold water and allow to completely drain. 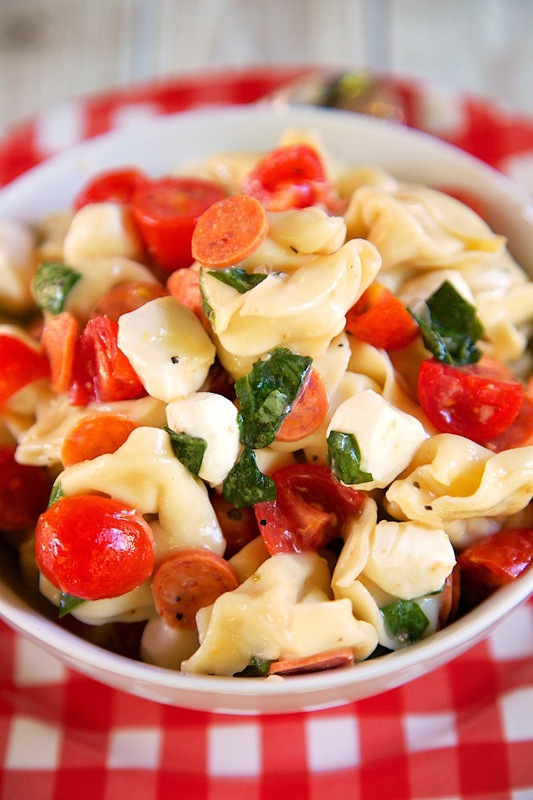 In a large bowl, combine cooked tortellini, mozzarella, pepperoni, tomatoes and basil. Pour Caesar salad dressing over mixture, toss well to coat. Transfer cooked tortellini to a large bowl and add remaining ingredients. Toss well. Refrigerate at least 1 hour before serving. This looks good! I wonder if you could also substitute the pepperoni for ham,bacon or salami. This is a fantastic no-fuss pasta salad, perfect to take to cookouts and potlucks. The fresh basil is a must. Don't skip that part. I just don't think dried would do this salad any justice. I absolutely love fresh mozzarella. I used regular sized pepperoni slices and just quartered them, but to save the step, next time I'll use the mini pepperoni slices like the picture shows. Either way it's fantastic! My guests devoured it and I got lots of praises. Thank you Steph for yet another awesome recipe!